Boat Owner’s Notes for a 2006 Hunter 41ac in excellent condition, call the boat owner@ 484-678-0324. Boat Location: Southport Marina, Southport, NC. Overview: This one owner 2006 Hunter 41 is equipped with all the Features and cruising amenities that its new owner could possibly want. 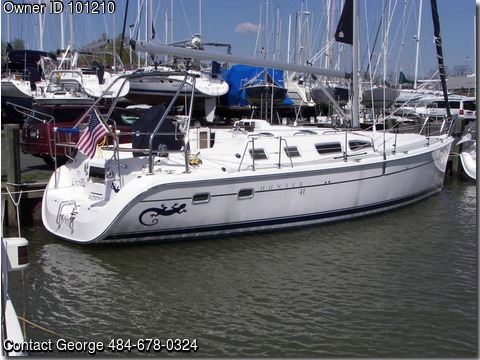 Features and Equipment: Complete Mariner package, in mast Roller furling on the main and Jib, dinghy davits, North Cruising Spinnaker, folding prop, Folding wheel, winter cover, full bimini and dodger, Raymarine ST 90 instruments with GPS, 3 new AGM Batteries, new Xantrex 2000watt Inverter Charger, 2 Enclosed Heads with Showers, 5’ draft with wing keel. Amenities: Flat Screen TV’s in all three cabins, Fans in each cabin as well as air conditioning, Bose Sound System, cockpit cushions. Full Galley: Double Stainless sink, Corian countertop, propane stove and oven, pantry, 100 gallon fresh water tank, 11 gallon hot water heater and more. Two Enclosed Heads with showers. Final Notes: The boat has mostly sailed the northern Chesapeake Bay area and was recently brought to North Carolina as a result of relocation, A survey was completed on December 15 and the boat was appraised in above average condition with a market value of $180,000.